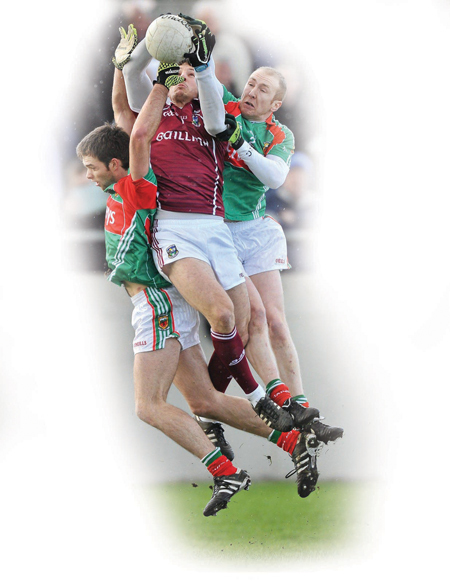 For Galway to win Alan Mulholland will be looking for big displays up front from the likes of Seán Armstrong - pictured here in action against Mayo’s Ger Cafferkey and Tom Cunniffe. If past performances are a good indicator of future performance – and they are – Mayo will beat Galway on Sunday at Pearse Stadium (4pm ). Mayo have won three out of the last four Connacht championships, and this Mayo team hopes to become the first team from the county to win a three-in-a-row of provincial titles since the early 1950s. Mayo are a division one team and have been for many years; Galway are a division two team and that is their current standard. In the past four years in the Connacht championship, Galway have been beaten by Mayo twice and Sligo twice. And the last time these sides met in championship was in 2011 in Castlebar, and Mayo won, pulling up by 1-12 to 1-6. Last August Mayo beat Dublin in the All-Ireland semi-final by 0-19 to 0-16, and they put it up to Donegal in the All-Ireland final. The flip side of the coin is that Galway were beaten by Antrim in the qualifiers after a heavy 2-14 to 0-15 defeat to Sligo at Pearse stadium. The very impressive u-21 All-Ireland win over Cork has given the county a genuine fillip and there is some good talent coming down the tracks over the coming few years - emigration and injury aside. However only four from that panel are on the senior squad. Fiontán Ó Curraoin and Tom Flynn are starting, with young Shane Walsh also expecting to see some game time. The other player on the panel is Tom Healy – the sub goalkeeper. Some people like to believe that a few new u-21s will drive a county to provincial success at senior level, but they must be blended into a core group of senior players who have the ability and desire to steer that ship into port. The bottom line is that Galway will have no real chance next Sunday unless the likes of Niall Coleman, Michael Meehan, Seán Armstrong, Paul Conroy, Gary Sice and Colin Forde really produce the goods and show the leadership needed to down James Horan’s men. Despite all the above, Galway are not without hope next Sunday. There are no “sure things” in sport and Galway do have a few pluses for next weekend. Mayo are hot favourites and perhaps they may be a tad over-confident. They have some genuine injuries and Michael Conroy is a loss. There is uncertainty over Barry Moran, Alan Dillon and Andy Moran. Plus, Galway have been targeting this game from a long way out and they will know that a victory next Sunday would open up a real chance of a tilt at a provincial title and a first day out in Croke Park in championship for five years. Realistically for that to happen, manager Alan Mulholland will be looking for big displays up front from Seán Armstrong, Paul Conroy, Conor Doherty and Danny Cummins. Those men have talent, but they will have to be at their best to hurt a teak tough Mayo defence that collected three All-Stars last year. Mulholland will also be hoping Michael Meehan can turn back the clock and produce a big display. Unfortunately, having watched Meehan in a good few games this year, it is obvious he is still struggling to get back to his best. As he has trouble training, due to his ankle, it is almost impossible to get back to full championship sharpness. Hopefully too, Tom Flynn and Fiontán Ó Curraoin’s selection will give Galway a foothold around the middle. If they do well, then Galway will be there or thereabouts. Based on what both counties have produced on the field of play over the past two seasons, it is impossible not to side with the team that has not lost a game in the Connacht championship in more than two years. It looks like a narrow Mayo victory. Galway team v Mayo: Manus Breathnach (An Spidéal ), Johnny Duane (St James ), Colin Forde (Killererin ), Gary Sweeney (Mountbellew/Moylough ), Gareth Bradshaw (cpt, Moycullen ), Keith Kelly (Ballinasloe ), Gary Sice (Corofin ), Niall Coleman (Annaghdown ), Fiontan O’Curraoin (Micheal Breathnachs ), Thomas Flynn (Athenry ), Paul Conroy (St James ), Conor Doherty (Tuam Stars ), Sean Armstrong (Salthill/Knocknacarra ), Michael Meehan (Caltra ), Danny Cummins (Claregalway ). Page generated in 0.1484 seconds.